Sharon Lam, Meghan Pulles, and Andrew Blair in The Can Opener. Photo by Jocelyn Johnson. BOTTOM LINE: A short, weird, and well-performed stage musical about the fear of college and zombies. Like a lot of festival shows, the concept for The Can Opener: A Brief Horror Musical is a bizarre one. 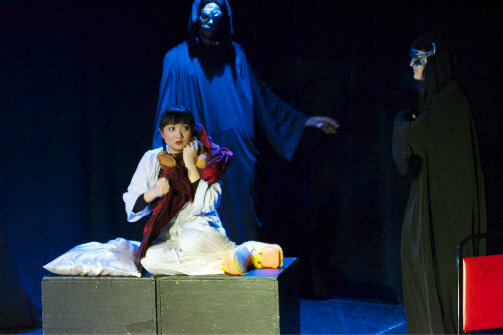 Bobbi (Sharon Lam), who is preparing to leave home for college, is haunted by nightmares about zombies. Then, one morning Bobbi discovers her nightmares are coming true when her father (Kevin Tucker) reads her an article from the newspaper about a series of mysterious deaths that sound a lot like her nightmares. Despite her objections, her parents force her to attend a college with some strange policies and teaching methods. There’s a witty connection thrown in between the brain-eating of zombies and the brain-molding of college and that’s about it. At around 30 minutes, this horror musical is, indeed, brief. Most of the show’s scenes come in the form of M. Zachary Johnson's simple but catchy and well-written musical numbers. Lam delivers her lines with a beautiful, almost operatic voice and emotes her character’s crippling anxiety nicely. Unfortunately, the night I saw the show, the music was just a little too loud and, even from the third row, some of the less strongly-voiced actors were difficult to hear. I'm pretty sure I missed some of the logic and continuity of Bobbi's story because of this, which will hopefully be addressed for their remaining performances. Overall, The Can Opener is a fun little flash of a bizarre concept realized through song. If you want to check out something short and sweet in the Frigid Fest, this weird little zombie musical is a great option.